Although we often hear that data speak for themselves, their voices can be soft and sly. In Frederick Mosteller, Stephen E. Fienberg and Robert E. K. Rourke, Beginning Statistics with Data Analysis (1983), 234. Did you hear Oxygen cheated on Magnesium? OMg. In Walden: Or, Life in the Woods (1854, 1906), 358. If you want to hear, you must begin by listening. Aphorism as given by the fictional character Dezhnev Senior, in Fantastic Voyage II: Destination Brain (1987), 238. In every enterprise … the mind is always reasoning, and, even when we seem to act without a motive, an instinctive logic still directs the mind. Only we are not aware of it, because we begin by reasoning before we know or say that we are reasoning, just as we begin by speaking before we observe that we are speaking, and just as we begin by seeing and hearing before we know what we see or what we hear. 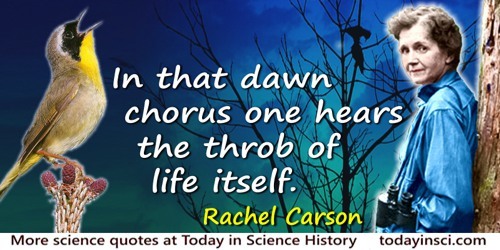 In that dawn chorus [of birds] one hears the throb of life itself. It is the nature of an hypothesis, when once a man has conceived it, that it assimilates every thing to itself, as proper nourishment; and, from the first moment of your begetting it, it generally grows the stronger by every thing you see, hear, read, or understand. The Life and Opinions of Tristram Shandy Gentleman (1759-67), Penguin edition (1997), 121-122. The products of the senses, especially those of sight, hearing, and touch, form the basis of all the higher thought processes. Hence the importance of developing accurate sense concepts. … The purpose of objective thinking is to enable the mind to think without the help of objects. As quoted in William W. Speer, Primary Arithmetic (1896), 1. Quoted by J.F. Kaiser, introducing Richard Hamming's address, 'You and Your Research', at the Bell Communications Research Colloquium Seminar, 7 Mar 1986. Whatever you can teach him from the nature of things themselves, do not teach him by words. Leave him to himself to see, hear, find, stumble, rise again, and be mistaken. Give no words when action or deed is possible. What he can do for himself, let him do. [Like people] if you torture statistics long enough, they'll tell you anything you want to hear. In Erica Beecher-Monas, Evaluating Scientific Evidence (2007), 63.